Day 1: Change your light bulbs! Save on energy costs at home by making use of natural lighting and replacing old light bulbs with energy efficient lightbulbs. LED lights help save energy and reduces the carbon footprint by a third (they last longer too!). 80% of the energy used by conventional light bulbs goes towards producing heat, not light. LEDs are more energy efficient because they use all of their energy for the product we want: light! To read more about why you should switch to LEDs, click here. Eat at a local restaurant to reduce carbon emissions – so food doesn’t have to travel far to get to your plate – and to boost your community’s economy. Eating local keeps your dollars local, which helps small restaurants thrive and builds stronger relationships. Food Miles is a term that refers to how far food travels from the farm to table. It takes into account factors that we might not be thinking about. For example, it takes 25 gallons of oil to produce one truck tire, like the ones spinning along the roads to transport your food. To read more about Food Miles and to learn about other important sustainability terms, visit Lexicon of Food. We love Lexicon of Food: it’s a crowd sourced, peer-reviewed glossary of food-related sustainability terms with helpful infographics. It’s an offshoot of the Lexicon of Sustainability, a nonprofit based in California that works to accelerate widespread understanding of the terms associated with sustainability. Purchasing food and goods at your local farmer’s market (or from local companies featured at your grocery store) helps keep money flowing locally, which boosts the economy and helps reduce carbon emissions. Find out more about our Farmer’s Market here and be sure to follow us on Facebook and Instagram for updates on what’s happening at the market. We close for the season December 15th and re-open March 2nd, so there’s only a couple of months you’ll have to go without our local, fresh produce, meat, jams and jellies, seafood, honey and more! Day 4: Turn off your lights! Reduce light pollution by either turning off indoor and outdoor lights when not needed or making use of natural light when possible. This simple act conserves energy (and money!) and is better for wildlife. Light pollution is detrimental to many different wildlife, such as the Great Barrier Reef, migrating birds, sea turtle hatchlings, and human beings. There is evidence to suggest that our circadian rhythms are negatively affected by light pollution. This New York Times article, Illuminating the Effects of Light Pollution, explains in detail. To become part of the anti-light pollution movement, consider participating in International Dark Sky Week. The dates for 2019 are March 30th-April 7th. Dark Sky Week was started by high school student Jennifer Barlow in 2003. Read more about how to participate here. Keep cool air in and hot air out (or vice versa!). Turn off your cooling system and open your windows while sleeping (during summer) or afternoon (during winter). Then shut the windows to contain the cool air during warmer parts of the day. Day 6: Make a pot of soup! One simple way to cut down on food waste is to save the trimmed ends or peelings of vegetables like celery, carrots, onions, mushrooms, and potatoes in your freezer. Once you’ve got a big pile, throw them all in a pot, cover with water, and make homemade vegetable stock. Composting is a great way to cut waste, reduce trash in landfills, and help put nutrients back into the soil. It is quite easy to make by combining compostable waste materials from your own household to make nutrient-rich, plant-enriching soil. The Compost Queens provide a composting service that gets your food waste to local farms. It’s $10 a month to drop off at Eco Centro and $15 a month to have it picked up at your home. Even better, they use Bokashi style composting, which means you can put meat and dairy in your compost as well as cooked and uncooked vegetables (and a lot more). We spoke with one of their co-founders and made an informational video about what they do. Scroll up to the top of the page to view it, or click here. Save money and reduce food waste by tracking what you put in the trash. You might be surprised by your results! This quick Food Waste Quiz will show you where you can improve. Save money and reduce food waste by learning how to store your food for maximum shelf life. Check out Still Tasty for a complete guide on shelf life and alternative uses for your favorite foods. If there are lots of pantry items languishing unused in your home, as well, the San Antonio Food Bank wants them! Here are their most wanted items. For over 25 years, community supported agriculture (CSA) has become a popular way for consumers to buy local, seasonal food directly from a farmer. Interested customers purchase a share (a.k.a. “subscription”) and receive a box of seasonal produce each week throughout the farming season. This benefits farmer’s and consumers by allowing them access to ultra-fresh food with all of the flavor and vitamin benefits. Zanzenberg Farm offers a Pork Share program, and JBA Organics is a regional farm providing CSAs to the Austin and San Antonio areas. Here's a video we made of Zanzenberg Farm, or scroll up to the top of the page to watch. Get to know your farmers and support them! They're working hard to provide clean, healthy alternatives to conventionally farmed food. Donate unused or unwanted pantry items to your local food bank. The twelve most wanted items for the San Antonio Food Bank are listed on their website here and the list includes common items like peanut butter, beans, mac & cheese, and tuna. Common household cleaning products are among a number of indoor pollutants that can hurt the environment as well as human health. The next time you get an urge to tackle those stovetop stains, consider concocting your own non-toxic cleaning products (that work just as well as the chemical-filled stuff) or doing some research to find the most eco-friendly agents. When you go to the grocery store try using your own bags. A single plastic bag can take 400 – 1,000 years to break down in the environment. As it breaks down, plastic particles contaminate soil and waterways and enter the food web when animals accidentally ingest them. Citizens, with or without a scientific background, can help with data collection that contributes to the projects of scientists. Citizen Science is emerging as a vitally important resource for worldwide data collection. Here at the CNC&F, Citizen Science is used to track environmental changes – counting birds, butterflies, snakes, frogs, surveying vegetation, assessing water quality and many other endeavors – monitor the wildlife community of the park and then inform land management. Data collected during these activities is also made available to researchers through online databases globally. Consider using loose leaf tea versus tea bags. It eliminates packaging and there is a higher amount of nutrients and beneficial antioxidants since the shelf life is shorter. Day 18: Catch the rain! Contrary to popular belief, rain catchment is easy to use and install. Most simple catchments take only 30 minutes to set up and retail starting at $40. You can also get creative and create a DIY version as a fun family project! Try eating one vegetarian meal per week. If done regularly, it can help lower your grocery bill and cut your carbon footprint in half! Did you know there are many different types of plastic each containing different chemicals and components? Check the bottom of plastic containers you reuse more than once to see if they are safe for long-term use. Numbers 2, 4, and 5 are generally safe, while numbers 3, 6, and 7 aren’t. If your plastic doesn’t have one of the “good” numbers, try to recycle it. Long-term use could cause unsafe chemicals and toxins to leach into your food over time. Shop in the bulk section of the grocery store whenever possible. This saves money and helps ease the burden that plastic and packaging have on the environment. Not hosting Thanksgiving dinner? Try taking Tupperware along with you so you can save leftovers and cut down on food waste. Most foods can be frozen up to six months! Most water bottles will last you a lifetime. Ditching the plastic and using your own saves money and the environment. Try to carpool whenever possible. According to rideshare.com, every car annually emits its own weight in carbon dioxide into the atmosphere. Carpooling reduces that amount significantly. If you carpool to and from work (or to family and friend hangouts) you could potentially cut your transportation costs and emissions in half! Take time to unplug and reconnect with nature. Instead of watching T.V., try going for a brief walk with family or friends, or sit outside with a cup of coffee or tea. Studies show that spending just 15 minutes outside (compared to the 8+ hours spent on technology) boosts creativity, reduces stress and fatigue, and makes us feel happier. Birds are important because they keep systems in balance: they pollinate plants, disperse seeds, scavenge carcasses and recycle nutrients back into the earth. But they also feed our spirits, marking for us the passage of the seasons, moving us to create art and poetry, and helping us stop and take notice of the sounds of nature. Consider giving someone “the bird” by signing up with a loved one or friend for one of our birding workshops. 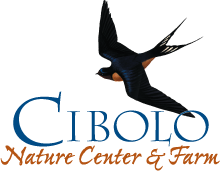 Here at the CNC&F we have a variety of bird species to track and discover, including the federally endangered golden cheeked warbler (only found throughout the Texas Hill Country in the ENTIRE WORLD). Give the gift of Nature today! Entering its seventh year, #GivingTuesday is a global day of giving fueled by the power of social media and collaboration. We humbly ask for your support in making a #GivingTuesday donation in our honor. 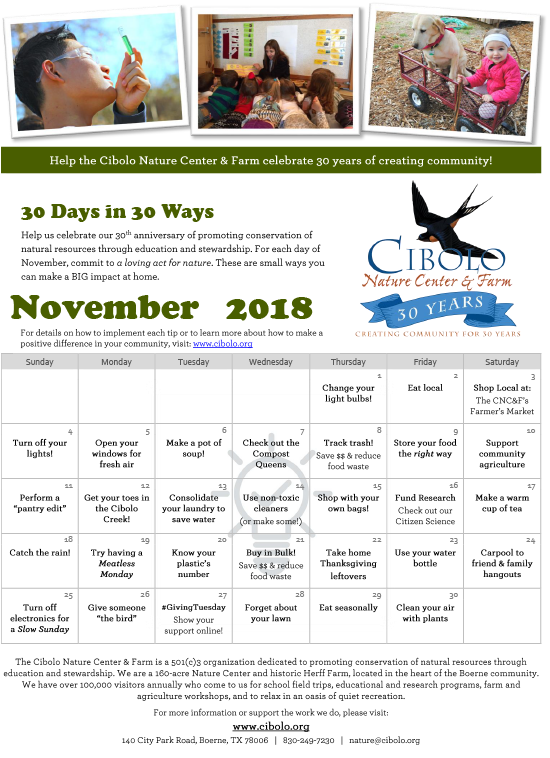 Give online today, tag us on your social media outlets with #GivingTuesday, and make sure to give us a shout-out (@cibolonaturecenterandfarm) so we can thank you for your generosity and feature you on our channels too! Tired of watering and mowing your lawn? Consider xeriscaping a portion or all of it! Not only does it have great curb appeal, but it’s also low maintenance and a great way to conserve water. Visit https://www.seasonalfoodguide.org/ to find which foods are in season near you. When you eat seasonally, food is richer in essential vitamins and minerals and also more affordable to purchase (think blueberries and strawberries). You can further take advantage of these benefits by buying in bulk and either freezing or canning fruits and vegetables to enjoy throughout the year! You can freeze most produce for up to a year and a half and canning/jarring food can extend its life for years. Consider decorating your house with easy to maintain houseplants such as English Ivy or Spider Plant. Not only does it add color and beauty to your living spaces, but it can also clean and purify the air in your home naturally! According to NASA research, plants remove toxins from air – up to 87% of volatile organic compounds (VOCs) every 24 hours. VOCs include substances like formaldehyde (present in rugs, vinyl, and grocery bags), benzene and trichloroethylene (man-made fibers, inks, and paint). The NASA research discovered that plants purify the air by pulling these contaminants into the soil, where root zone microorganisms convert VOCs into food for the plant.